Most boats carry sails that perform well enough to satisfy on trade-wind routes where three-quarters of the time the wind may be aft of 110 degrees apparent and there are opportunities for flying symmetrical shaped sails, like square sails and spinnakers. Spinnakers are usually made of a light material that doesn’t require a lot of energy to lift. While a tall mast may allow a larger spinnaker to be flown than otherwise, careful tending by crew is usually necessary to keep the sail from collapsing once the boat gains speed and the apparent wind approaches zero. In addition, should the spinnaker fill to a side, rather than ahead, owing to a swell or steerage problem, its large size can knock down the vessel. 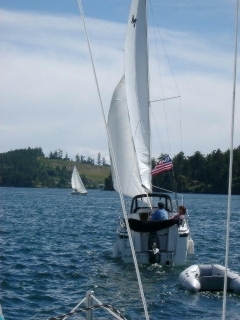 For all practical purpose, spinnakers are not favored on cruising sailboats. Instead a large asymmetrical sail made of a spinnaker like fabric will be used. 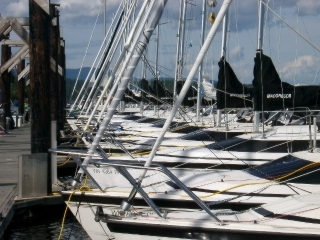 These are not true spinnakers but rather a large Genoa which on some contemporary boats can be use for upwind work, in light air, especially if mounted on roller furling. While a contemporary vessel may sail to weather in normal wind, few traditional cruising boats do. Such work is required one-third of the time after leaving the tropics for the temperate latitudes and motor assistance eases the work. In the higher latitudes, wind ahead of the beam may come more than half the time with over Force 7 wind about one-third of the time. In Force 7 wind, the apparent wind on a modern sloop or multihull can be forward of the beam, even when sailing down the true wind. This is the defining characteristic of high-performance sailing. Unless the captain is in a hurry, not all the cloth will be flown in Force 7 wind, on a modern cruiser, and hence there is no advantage to a tall mast. Force 7 wind is often small craft warning conditions. Unlike most small power craft, small sailing cruisers are not usually open to the sea, so they are more suitable for offshore or rough water operation. Force 7 wind usually is just fine for a small cruising sailboat. Many heavy keel sail boaters consider Force 7 wind ideal for flying all the cloth. However, on modern and small cruisers, the optimum heel is usually lost unless a sail reduction is made. In other words the vessel is actually faster with less sail in these conditions. Given an itinerary that foregoes trailering or containering (which is the smart choice, from an investment protection viewpoint if nothing else) a boat should, for safety reasons, be capable of efficient passage making to weather in 20-to-30-knot winds and the accompanying seas. That translates in to motoring/ motor assisted sailing for most mono hull contemporary cruisers. Most high performance mono hulls and multihull cruisers are capable of close reaches in Force 7 winds without motor use. These need not carry a large amount (over 100 gallons) of fuel. Murrelet is quite happy going to weather in Force 7 conditions (28 – 33 MPH) without motor assistance and will self steer to weather. This is a testament to Mac26x suitability as ocean going vessels. Many ocean high-performance single-handed race vessels must make use of sophisticated auto pilot electronics because each wave and swell causes a roll which changes the shape of the hull presented to the water and with that changing amounts of lee or weather helm. Most of the canting keel ocean racers appear incapable of making an up course in Force 7 and above. Those are not suitable for ocean crossing by my way of thinking unless the crossing is all down wind and the intent is to container the vessel for the return passage. 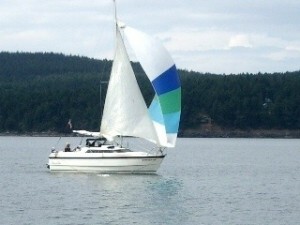 Owing to sphere like qualities forward of the beam, similar to Spray and referred to as a cods head by traditional sailors and a powerboat belly by Murrelet’s manufacturer, conflicting waves from wind, swell and shoal, do not roll Murrelet from side to side drunkenly, causing significant upwind steering problems while under sail. A spherical form will respond the same way regardless of conflict. It will lift and drop rather than roll and pitch and lift and drop. Chapman’s recognizes a sphere as the perfect hull form with a tube form (think of the outer hulls on the trimaran in Water World) being second best. The Murrelet has a sphere form forward and presents a racing canoe tube-like form to the water when on heel in the aft section. 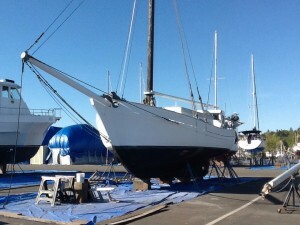 The give in the rigging also contributes to making the Mac26x an ideal ocean sailboat. While perhaps not gentlemanly you can let fly large head sails both upwind and downwind. MacGregor Yacht Corporation began in the early 60’s as a class project at the Stanford Graduate School of Business, while Roger MacGregor was earning an MBA degree. The company has always been the most innovative in the industry. We invented the retracting keel and started the trailerable sailboat market, the fastest growing segment of sailing. After MacGregor built tens of thousands of retracting keel sailboats, cars became smaller and lighter. Weight reduction became essential for safer and easier trailering. We then invented the water ballast system, that provides the safety of a true keelboat, with the light weight needed for trailering and high performance. The MacGregor designed water ballast system has been copied by other major builders, and has become the new standard for the trailerable sailboat industry. The light weight then allowed us to develop a high performance sailboat that can be driven at high speed by relatively low horsepower outboard motors. The culmination of all of this is the MacGregor 26. Most major sailboat companies have had a shot at making trailerables, including such well known names as Islander, Columbia, Cal, O’day, Clipper, Coastal Recreation (Aquarius), Newport Boats, San Juan, Ericson, Bayliner, Reinell, Laguna, Olson, Schock and dozens of others. They are either gone completely, no longer attempt to compete in this market, or are building so few of this type of boat that they are no longer a significant factor. The trailerable cruiser is a small boat with the amenities of a big boat. To pack these amenities into a boat which is light enough to haul around, and to take the abuse of trailering, you really have to optimize. They were unable to do this, control costs, provide performance, or give customers what they wanted. Acquisition by large conglomerates sank several companies under layers of management. Many suffered from warrantee problems and others died off because they had so many types of boats in their line that they couldn’t concentrate on building detailed, foolproof, low cost tooling and production systems for any one boat. The result is that we have the best selling boat of this type in the world. We have built over 36,000 sailboats. In this competitive society, we would have been gone along time ago if our boats weren’t right. Sail Magazine recently recognized MacGregor as one of the most innovative of the sailboat builders over the last 3 decades, and as the builder that brought affordable sailing to thousands. Post by Cruising World Magazine. Post by Scuttlebutt Sailing News.